Today car enthusiasts are swarming for information on the new 2020 Toyota Supra, inspecting its BMW engineering under the skin and decoding its BMW straight six. 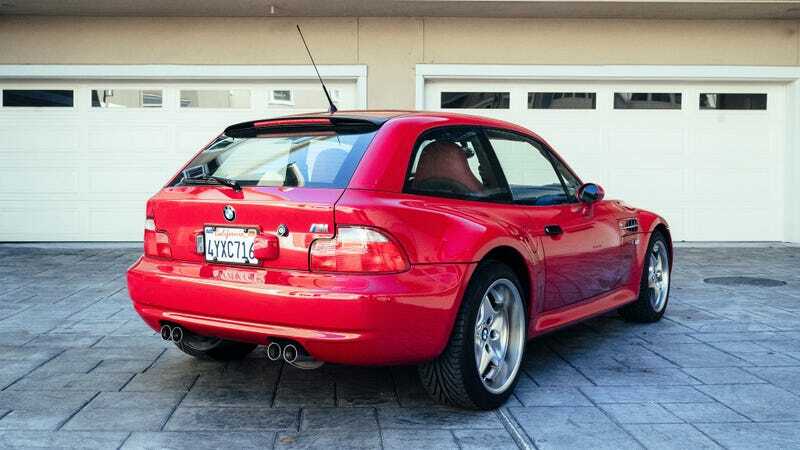 Maybe that’s why the bidding is already so high on this “Clownshoe” 2002 BMW Supra, I mean BMW Z3 M Coupe, with just 4,454 miles. The car is up for sale on that home of high-priced Supras, Bring A Trailer. No trailer is needed for this particular car, which is in fine running condition, spotless inside and out. Find the full listing for this car here. This is a Jalopnik Fantasy Garage car for a reason. It is a driver’s car through and through, the product of an after-hours program by BMW engineers to make something mechanically perfect, aesthetics be damned. The result both runs fantastic and happens to look almost unintentionally amazing. The legendary S54 straight six gives you 315 horsepower and runs up to 7,600 RPM. That’s less than the M3 of the day, but the M Coupe was a couple hundred pounds lighter. This car only has 3,046 pounds to push around. Power goes through a five-speed manual, as is dutiful and proper. This particular example has been registered as a non-op for the past few years in California and has only logged 200 miles over the past 12 years, according to the listing, making this probably as close to a museum car as you’re going to find for one of these things. That’s a silly buy for anyone interested in hard driving (and hard driving is what these cars are all about), but it’s a stunning example of a very rare car. Only a couple hundred exist, a few dozen exactly like this one. Personally, I will eternally think of these things as bargain buys for serious enthusiasts, but that hasn’t been the case for a while. Bring A Trailer tracks values on these cars, and have turned a couple around for around $50,000 since early 2016. Four days remain on the auction. I expect the closing price to be high.